I apologize for not having any post of substance for the past little bit. I cut my finger and I wasn't feeling the idea of putting nail polish remover on it. So I waited until it was mostly healed. You can still see the little scabby on my index finger. (Boy, did that ever sound gross.) I'm actually surprised how shotty my application was. I can't believe how out of practice I got after only four days. Shameful. 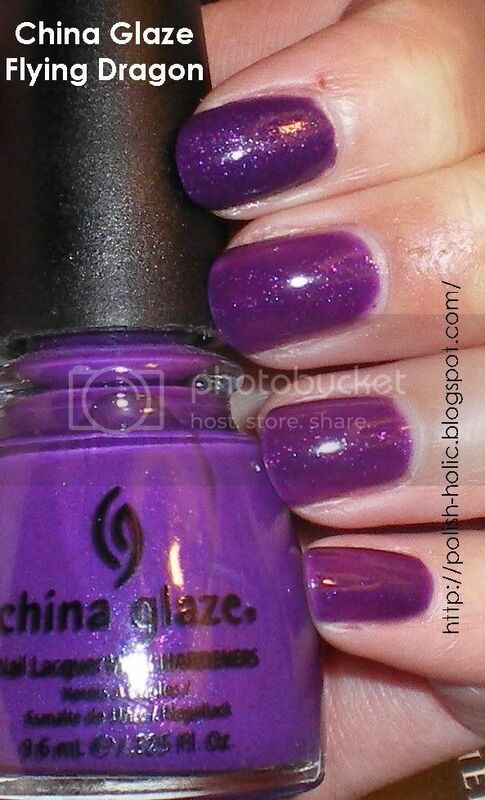 Flying Dragon is a purple polish with blue and red glitter. Very pretty. But my crappy application doesn't do a very good job showcasing it. The polish is watery so this is three coats. You can see on my index finger what the polish is capable of. That finger got one thick coat and two thin coats. All the other fingers got three thin coats. It'll probably require four thin coats for full coverage. Or do a thick coat somewhere. The polish dries sort of satiny matte. Not wicked shiny like I'm used to with most polishes. The picture is taken with no top coat. Edit 6/12/2010: I've done an updated swatch, you can check that out here. Yummy! This is going to have to find it's way onto my wishlist! That is a orgeous color on you! I am selling mine. I have seen some gorgeous swatches but it was a big let-down IRL. Thin, patchy. I never got the blue sparkle you can see in the bottle. It dries matte as it's a neon. I think you have to work hard with this one. I want to dab and go. Small Town Gal: I think it's really pretty when it's done right. I'm glad you still think it looks good after I've screwed it up. gildedangel: Well thank you very much! jaljen: Yes, it's definitely a polish that requires work to look good. At least three coats, definitely needs a shiny top coat. Not a quickie polish. Gorgeous colour! love love love it.